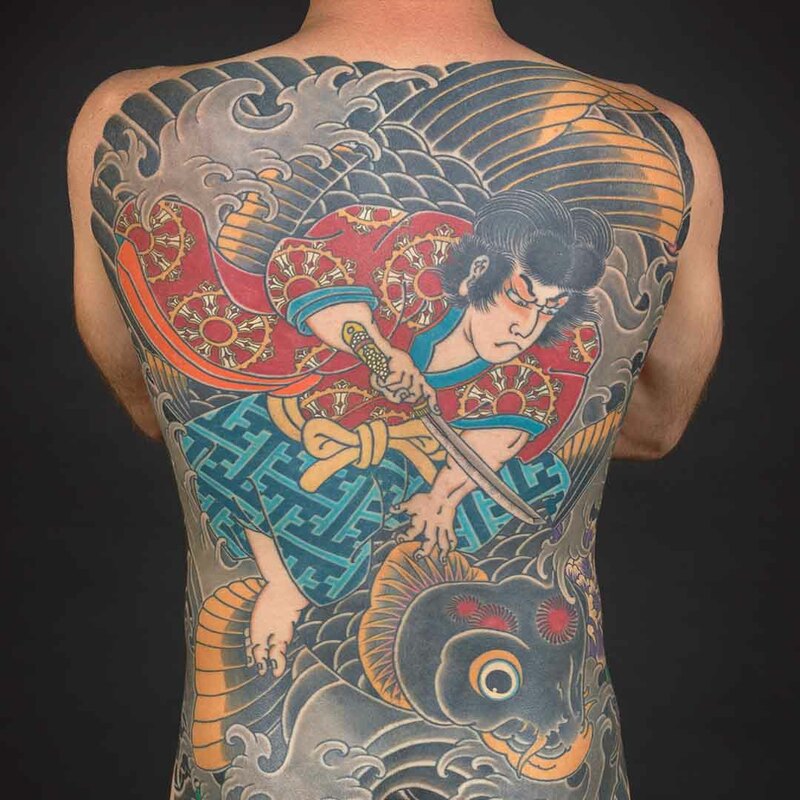 See the artistry of traditional Japanese tattoo up close and personal in this stunning photographic exhibition, from the Japanese American National Museum in Los Angeles. 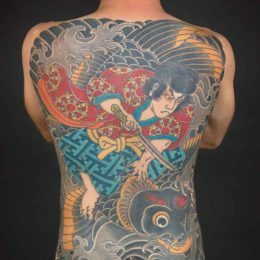 Perseverance features the work of seven internationally acclaimed tattoo artists—Ryudaibori (formerly Horitaka), Horitomo, Horishiki, Miyazo, Shige, Junii and Yokohama Horiken—along with tattoo works by selected others. Includes life-sized photographs of full body tattoos. This exhibition is part of the Uncovering Japanese Tattoo event series, featuring an exhibition, talks and a demonstration. View the full program here. 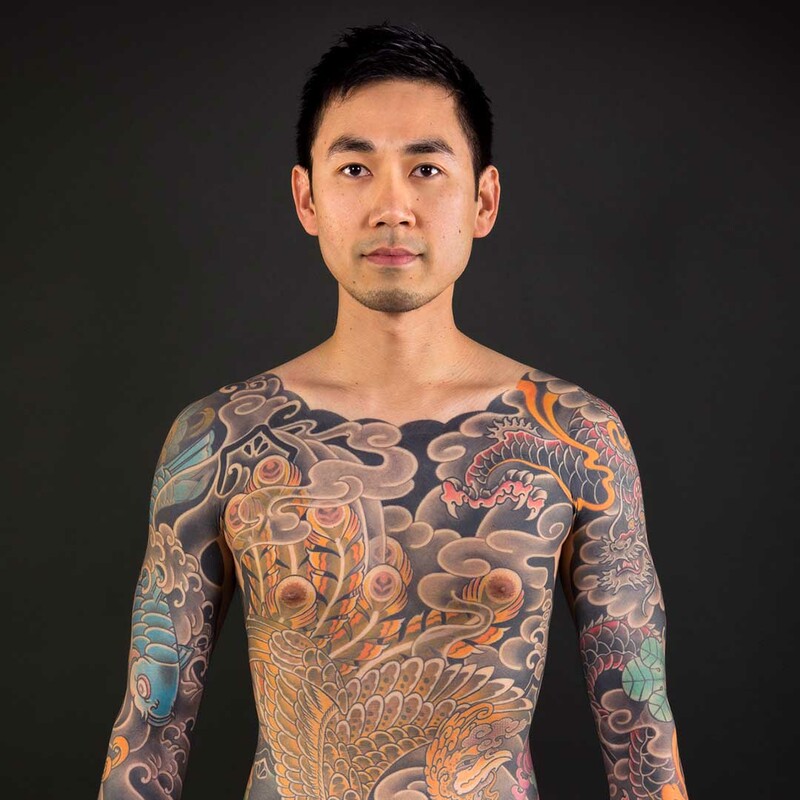 Kian ‘Horisumi’ Forreal learned to tattoo in Toronto, Canada, and has been tattooing professionally worldwide since 1993. He was given his traditional Japanese tattoo name (‘Horisumi’) by tattoo master Horiyoshi III in 2013, after 20 years of tattooing. This tattoo name is an honorary title in recognition of Kian’s long-term dedication to traditional Japanese tattooing, and the outstanding quality of his work in this area. Kian practices the wabori style of tattoo, which blends the old-world style of hand-made inks and single needles hand-soldered into specific configurations, with the speed and accuracy of machine tattooing. 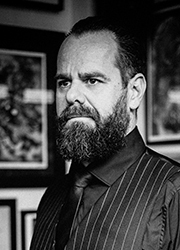 Kian is the only Western-born tattoo artist in Australia to have received a tattoo title from a Japanese master. His studio, Authentink, is in Surry Hills, Sydney. Kip Fulbeck is a photographer, artist and academic from the US. 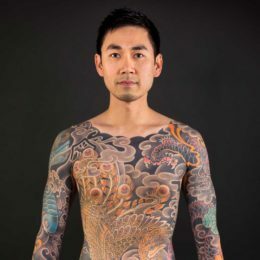 He is the author of several books, including Part Asian, 100% Hapa (Chronicle Books, 2006) and Permanence: Tattoo Portraits by Kip Fulbeck (Chronicle Books, 2008). He has exhibited his work and performed spoken word throughout the US and abroad, including solo exhibitions at the Japanese American National Museum (Los Angeles), Invisible NYC Gallery (New York), The Field Museum (Chicago), the Museum of Migration (Yokohama) and the Nikkei National Museum (Vancouver). A Professor of Art at the University of California, Santa Barbara, he is the recipient of the university’s Distinguished Teaching Award, and has been featured on CNN, MTV, CBC Canada, Voice of America, National Public Radio, and The New York Times. Yoshimi Yamamoto is a professor of cultural anthropology at Tsuru University in Japan. 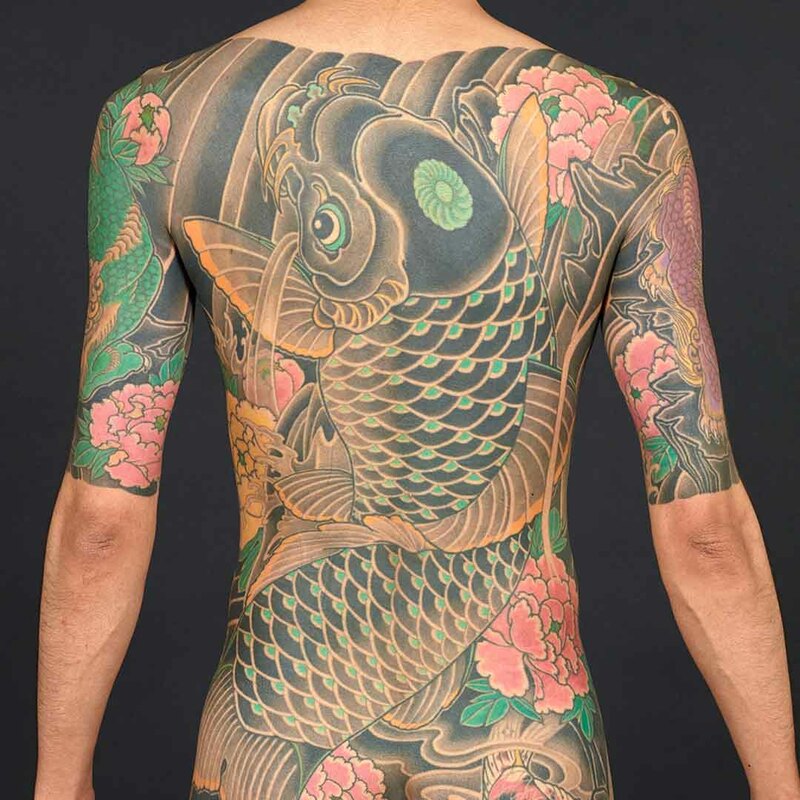 Yamamoto began researching tattoos in 1990 from a cultural anthropology perspective, and was the first scholar to complete a PhD on tattoo at a Japanese university. Her PhD research explored contemporary tattoo history in Japan, combining interviews with Tokyo-based tattoo artists, anthropological research on the tattoo culture of Okinawa and the indigenous Taiwanese and text-based scholarship. 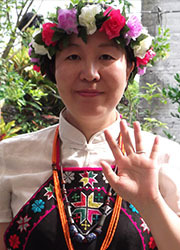 She later spent three years on exchange at Taiwan’s national research institute, Academica Sinica, before returning to Japan in 2003 to teach at Tsuru University. As one of the few researchers of tattoo in Japan, she was involved in producing the exhibition Tatoueurs, Tatoués at Musée du quai Branly in Paris in 2014 and 2015, and has been an advisor at a symposium of the Kanto Federation of Bar Associations. Her most recent publication, Irezumi to Nihonjin (“Tattoos and the Japanese”), was released earlier this year and examines the changing perceptions of tattoos in Japan from the 18th century to the present, uncovering the background to the tattoo bans that are widely enforced at bathhouses today. 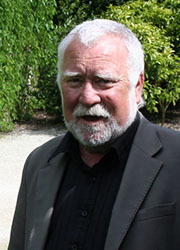 David Bell is an associated professor at the University of Otago. He first learned Japanese woodblock print technique during his early studies in fine arts. Later he explored the history and aesthetic sensibilities of ukiyo-e ‘floating world pictures’ through his postgraduate and doctoral research in art history and theory, and has subsequently taught graduate and postgraduate courses in Japanese art history, ukiyo-e, and Asian studies. Today, he also teaches visual art education programmes with primary and secondary level preservice students. David continues to research into Japanese arts and cultural studies, publishing extensively on themes that include the collection of ukiyo-e, art museums and gardens, and invention and creativity in Japanese visual worlds. David is currently collaborating with The Museum of New Zealand Te Papa Tongarewa in the acquisition of an extensive collection of ukiyo-e, and working towards co-publication of a research monograph about these works. His monographs include Hokusai’s Project: The Articulation of Pictorial Space (Brill 2007),Ukiyo-e Explained (Brill 2004) and Chushingura and the Floating World: the Representation of Kanadehon Chushingura in Ukiyo-e (Routledge 2001). 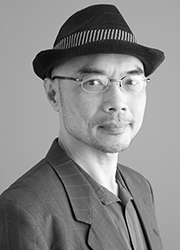 Leong Chan is Associate Professor of graphic design at UNSW, where he teaches visual communication and information design, and supervises research in design interventions for health and wellbeing at the Faculty of Art & Design. Leong’s current research focuses on cultural identity, national experience and print culture in China, Hong Kong and Singapore, and his PhD research focused on graphic design and the visualisation of multi-racialism for nation building in Singapore. Leong’s interest in ukiyo-e and the work of Yoshitoshi stems from his background in graphic design and printmaking.